Here's how to pull of trick shots so you can rule the court in Mario Tennis Aces. Mario Tennis Aces is the latest entry in the long-running series of Mario sports games. It brings plenty of intriguing changes to the table, such as new moves that are absolutely integral to your success throughout the game. One in particular is the Trick Shot, which lets you smash the ball to nearly any point on the court. It has its limitations, of course, but whether you're trying to get a service ace or defeat a boss in Adventure Mode, it's going to be an invaluable part of your arsenal. It can be a bit tricky to get used to pulling off, however, so we've put together some tips on how to use the Trick Shot in Mario Tennis Aces. You'll be burning up the court in no time! 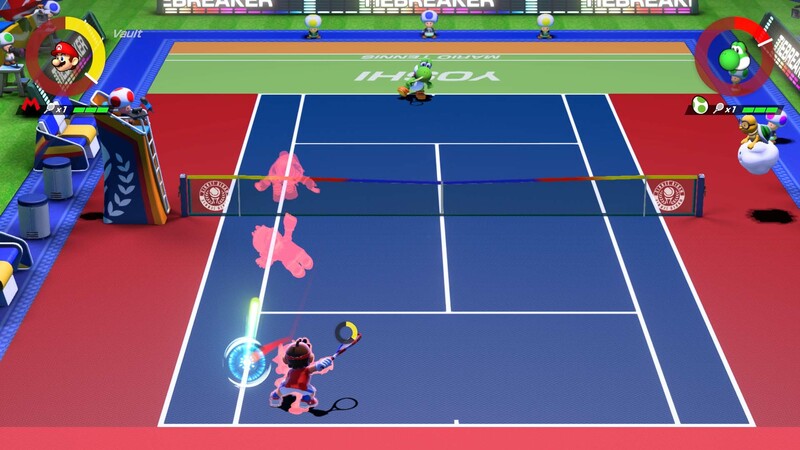 You can perform a Trick Shot in two different ways in Mario Tennis Aces, and one is a little easier than the other. The simplest way to perform a Trick Shot is to tap your right analog stick in the direction that you want to move. You'll need to do this relative to where the ball is to our character. If the ball can be seen to the left of your character, then make sure you tap to the left. If you see the ball has moved past you quite a bit, press down on the analog stick. When you tap the stick, you'll perform your Trick Shot animation, and it cannot be canceled, so you're locked in from there. It's imperative that you don't make a mistake when making the decision which direction you want to move in, so doing the wrong thing could very well cost you points during a match. Your character will then perform a flashy acrobatic move, and swing their racket. When the racket hits the ball, then you'll want to press the corresponding shot button to pull off the move of your choice. If you want a topspin shot, for instance, just press A when you smash the ball with your racket. Alternatively, you can double tap the X button while holding down the direction you want to move in on your analog stick. The direction you're holding will be where your character moves during the Trick Shot, just like the analog stick option mentioned above. You can swing your racket when you get near the ball in the same way here as well. Make sure you don't screw up your timing, however, because if you end up going for the ball and miss it, you'll lose part of your Energy Gauge. If you crush it, you'll gain additional energy. This can be helpful in long-term boss battles or difficult challenges where plenty of energy is tantamount to success. You can use Trick Shots just about any time you want. But you'll really want to focus on pulling them off when you see a ball that you don't think you're going to hit. That's when you want to use one to quickly maneuver over and grab it before it flies out of reach. Missing balls can be detrimental in challenges and regular tennis matches, and if you can use this strategy to catch them, you'll be dominating in no time. Trick Shots are extremely important if you want help building up your Energy Gauge. That's what helps you pull off Special Shots, Zone Shots, Zone Speed, and other important moves during each match. If you can pull of Trick Shots with perfect timing over and over again, you'll get a massive amount of energy as a reward. Some characters excel at performing Trick Shots over others, so find the right character with a good balance for you, and focus on Trick Shots to gain the upper hand whenever possible. That's about all you need to know about performing Trick Shots and how they can help you in the long run in Mario Tennis Aces. For more information, be sure to check out the rest of our coverage on Nintendo's latest entry in the Mario Tennis series!